The solution is simple to show Additional Clocks in Windows 8.1 / 8 taskbar! With additional clocks in Windows 8.1 / 8 show (display) the time for other time zones. 1.) ... Display and customize the Additional Clock in Windows 8.1 / 8! 2.) ... The additional clock access (view, show)! 3.) ... The available time zones in Windows 8.1 for Additional Clock! 1.) Display and customize the Additional Clock in Windows 8.1 / 8! Press the [Windows+R] key combination and enter the command timedate.cpl! Please confirm with ENTER (... see picture 1 arrow 1)! Now click on the "Additional Clocks" (... see picture 1 arrow 2) and activate the auxiliary clock in Windows 8.1 / 8! (... See picture 1 arrow 3)! Now simply select the time zone for the additional clock! (... See picture 1 arrow-4)! Enter display name for the additional clock in Windows 8.1 / 8: (... see Image-1 Arrow-5)! (Image-1) Share the Additional Clocks in Windows 8.1 / 8 taskbar! 2.) The additional clock access (view, show)! Additional clocks can display the time in other time zones. You can view them by clicking on or hovering over the taskbar clock. (... see Image-2 Arrow-1)! (Image-2) Additional Clocks in Windows 8.1 / 8 taskbar! 3.) 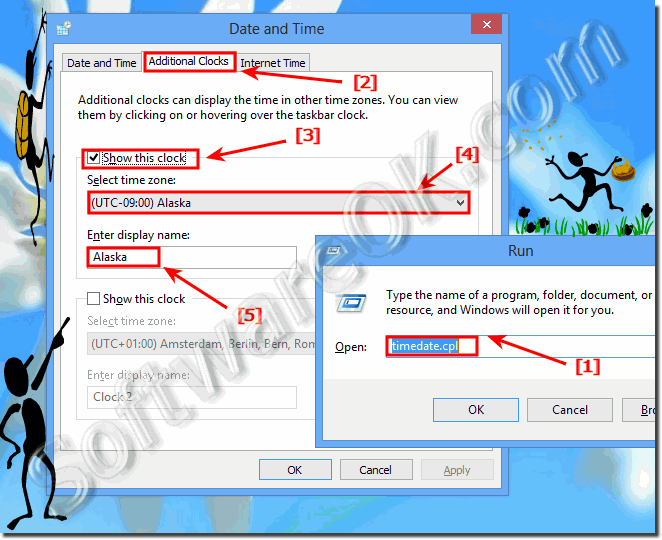 The available time zones in Windows 8.1 Additional Clock! 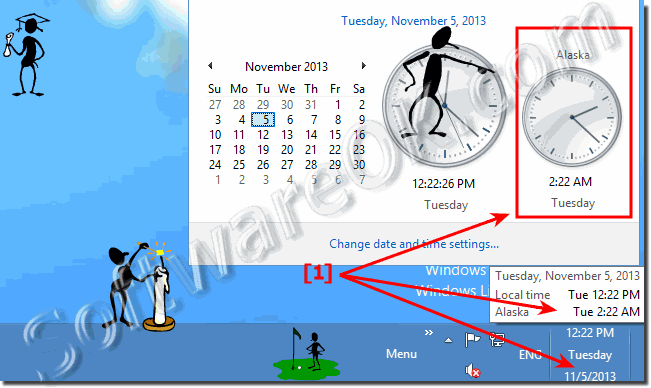 Windows-8 - FAQ-137: Additional Clocks in Windows 8.1 / 8 taskbar! Digital clock for windows task bar eg. show digital clock on taskbar windows 8.1? Windows 8.1 clock customize add? Clock for taskbar windows and more additional clocks windows 8.1? Simple clock in windows 8 taskbar? Add a Clock Windows 8.1? How do i add clock to my taskbar in 8.1? Add clock to windows 8 taskbar? Windows additional clocks more clocks? Display additional clocks windows 8.1? Adding clock win 8.1 and Win 10 customize taskbar clock? Windows 8.1 desktop taskbar clock gui? How to add clock to taskbar Windows 8.1 ? Windows 8.1 display clock on taskbar how do I display additional clocks? Taskbar clock for windows 8? Two clocks to task bar windows 10 or Windows 8.1 display clock on all taskbars? Show the clock on all taskbars windows 8.1? Show clock on all taskbars in Windows 8.1 seting on clock? Windows 8.1 show clock on taskbar? Show clock on taskbar windows 8.1? Windows 8.1 show clock on all taskbars? Turn off windows taskbar clock in Windows 10 or 8.1? Restore taskbar clock windows 8.1 ans add clock to taskbar windows 8.1? Customise windows 8.1 custom clock?